"Simple yet delicious. Cook garlic slowly to bring out the sweetness (the longer it simmers in the broth the better). I serve a bowl of this with a few grilled skewered shrimp laid over the rim of the bowl and crusty bread as a starter. Everyone that tastes it will want the recipe. This recipe is even better if you use a low sodium prepared chicken stock in place of the water and chicken bouillon"
In a large pot over medium heat, cook garlic in butter until brown. Pour in water and bring to a boil. Stir in bouillon granules, reduce heat and simmer a minimum of 20 minutes. Stir in tomatoes, whisk in eggs and season with salt and pepper just before serving. This was fab... I make this recipe a lot. You can all ways add your own special ingredents. I used spinach, mushrooms,more chicken gradules etc. 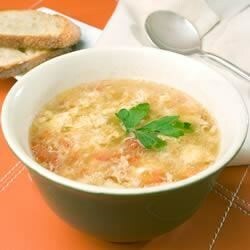 This is really just like egg drop soup. wonderful soup, maybe next time ill try onion with it, thank you!! This soup is fabulous. I used a large can of good brand chopped tomatoes. I also used a cup of the juice from those and only 5 cups of water. Thanks to TLYONS!